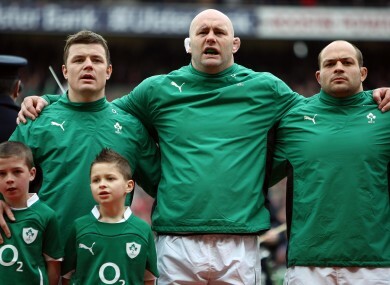 Hayes, centre, with Brian O'Driscoll and Rory Best. JOHN HAYES’S STELLAR service to Irish rugby will be recognised next week when the Munster legend is inducted into the IRUPA Hall of Fame. The 38-year-old, who called time on a career spanning almost 15 years last December, will become the 12th player to receive the honour at the IRUPA Rugby Players’ Awards next Wednesday, 9 May. “The Bull” joins a list of Irish rugby legends which includes Malcolm O’Kelly, Girvan Dempsey, Anthony Foley, David Humphreys and Keith Wood. “I’m delighted to be accepting this award and joining the great players already inducted into the IRUPA Hall of Fame,” Hayes said (IrishRugby). It’s a great honour and means a huge amount as it comes from the players I played with and against during my career. A part of Ireland’s Grand Slam-winning squad in 2009, Hayes led Munster’s Heineken Cup successes in 2006 and 2008 from his place in the front row. December’s Pro12 win against Connacht marked his 217th and final appearance for the province, during which time he won 105 international caps as well. The Bruff clubman was also a part of the British and Irish Lions tours in 2005 and again in 2009. Email “John 'The Bull' Hayes to join Irish rugby Hall of Fame”. Feedback on “John 'The Bull' Hayes to join Irish rugby Hall of Fame”.